Original Editors - Lauren Rouse & Laura Stigler from Bellarmine University's Pathophysiology of Complex Patient Problems project. 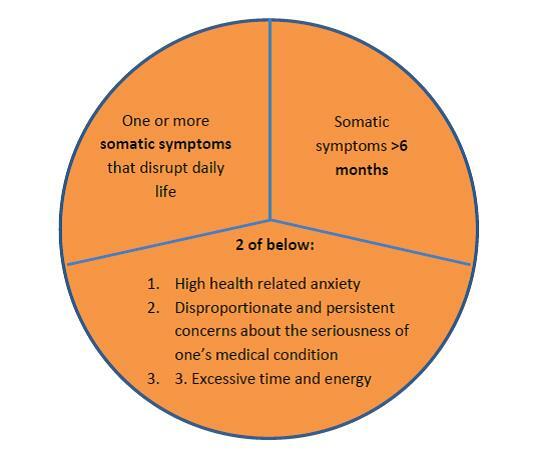 Somatic symptom disorder (SSD), as defined by the DSM-V code, occurs in individuals experiencing exaggerated and disrupted physical symptoms in multiple areas of the body, accompanied by exaggerated thoughts impairing activities of daily living. Diagnosis of SSD requires that the individual has experienced these symptoms for at least six months. This disorder has recently been updated from DSM-IV code of "somatization disorder" to the DSM-V code of "SSD". The prior diagnosis required patient complaints from four different symptom groups; however, this is no longer required with the DSM-V code. In addition, patients experiencing these symptoms associated with other comorbidities such as heart disease, osteoarthritis, or cancer were previously excluded from the DSM-IV diagnostic code. The DSM-V definition now includes these patients under the diagnostic code of SSD, even if the psychological symptoms were secondary to the primary diagnosis. These patients are considered appropriate for psychological treatment; however, a full psychological evaluation is needed to rule out other possible disorders. The previous diagnosis of "somatoform disorders" is an ambiguous term and is not easily translatable between different languages, as it blends Latin and Greek roots. Somatic symptom disorder has made the diagnosis easily translatable. The previous DSM-IV diagnostic code utilized "Medically Unexplained Symptoms" as the definining characteristic. This terminology is no longer acceptable. Patients may feel their complaints are deemed illegitimate in the medical community. Medical diagnosis should also never be made on the absence of symptoms. Finally, these symptoms are often unexamined rather than unexplained. Overlap between somatization disorder, undifferentiated somatoform disorder, hypochondriasis, and pain disorder made the DSM-IV code confusing and disorganized. The new code sets a boundary between SSD and illness anxiety disorder. Diagnostic criteria for previous DSM codes was confusing and unreliable, leading to strong specificity with weak sensitivity. Previous inclusion of "Undifferentiated Somatoform Disorder" in the DSM-IV code loosely defined the diagnosis making proper diagnosis inaccurate. Non-psychiatric physicians have rarely diagnosed the disorder due to the confusing nature of previous codes preventing accurate prevalence statistics of previous DSM codes. The new code has been implemented in attempt to improve communication between medical professionals of various backgrounds. The female-to-male ratio is 10:1 and may begin in childhood, adolescence, or early adulthood. Older adults diagnosed with somatization disorder is a rare finding. Older patients should be referred to a medical specialist for an underlying medical illness or consider depression as the primary cause of the individual’s perception of pain. Statistical prevalence on the prior DSM-IV code is inaccurate do to the confusing description of the disoder; therefore, non-psychiatric physicians have rarely diagnosed somatoform disorders. In addition, psychiatric physicians used ambiguous terminology in diagnosis of patients with this disorder. Lack of consensus among the medical community has lead to inaccurate prevalence statistics. Despite the frequency encountered in clinics and studies in medical studies, prevalence among Anthem Blue Cross insured individuals was 0.00002 out of 28 million subscribers and appeared rarely in the medical databases of Medicare, Medicaid and Veteran's Administration. Creation of the new DSM-V code is attempting to provide a straightforward and simplified definition of the disorder so that medical professionals are able to effectively communicate the medical diagnosis of SSD. Patients with SSD, with have one of the following as a dominate symptoms: somatic complaints, health anxiety, and pain. Pharmacological treatment for Somatic Symptom Disorder is not widely accepted and is not the preferred course of treatment. Reasons a patient with SSD would be prescribed medication if comorbidities such as depression and anxiety were also present. These comorbidities may make SSD harder to treat and resolve. The following may be prescribed or used to help control depression and anxiety and aid in the treatment of SSD. Criteria for Somatic Symptom Disorder. Disproportionate and persistent thoughts about the seriousness of one's symptoms. Reprinted with permission from the Diagnostic and Statistical Manual of Mental Disorders, Fifth Edition, (Copyright (c) 2013). American Psychiatric Association. All rights reserved. The diagnostic criteria for SSD focuses not only on somatic symptoms but also on psychological responses, including the patient's emotions, thinking and behavior of their symptoms. The severity of SSD can also be diagnosed as mild, moderate or severe. Diagnosis may or may not include another diagnosed medical conditions. Medically unexplained symptoms are no longer included in the diagnostic criteria and are discouraged. Describing the patients symptoms as medically unexplained is inaccurate because oftentimes symptoms are unexamined. In addition, patients suffering from somatic complaints may feel that medical professionals view their symptoms as inauthentic. The interrater reliability of diagnoses for SSD was listed as 0.61 in adult diagnoses. B-type criteria also has good test-retest reliability among physicians with an ICC of 0.680. Global rating of the severity of a patient's symptoms was found to have acceptable reliability with an ICC of 0.483. Focuses on stress management, activity regulation, emotional awareness, cognitive restructuring, and interpersonal communication. Considered best evidence-based treatment for somatisation disorder in 2006. Schedule appointments with patients on regular basis instead of as-needed appointments. Perform brief physical examinations focusing on area of discomfort at each visit. Avoid explaining symptoms with statements such as "Your symptoms are all in your head"
Data from the study by Allen et al suggests that a "10-session CBP produces improvements in somatization symptoms and functioning over and above those obtained from PCI, the only established treatment for [somatization disorder]". Physical therapy should be patient-specific and include manual therapy and/or manipulation. Instead of focusing on each physical symptom get the big picture by asking questions such as "How do these problems affect you?" or "How can I help you today?". It will be difficult to help the patient focus on the most important issues related to their health. Avoid therapeutic procedures unless necessary. These patients often have unrealistic expectations and may become angry if those expectations are unmet. "Assure the patient that the pain is 'real' (because it is) and that there is no need to prove it to anyone"
Total Somatic Symptom Score. This scale provides a predictor of health care status. On the left hand side of the flowchart below, disorders previously included in the DSM-IV code of somatoform disorder are listed. DSM-V has simplified its definition by placing these disorders into one of two groups, IAD (illness anxiety disorder) or Somatic Symptom disorder. This will help medical professionals in differentiating IAD and SSD. 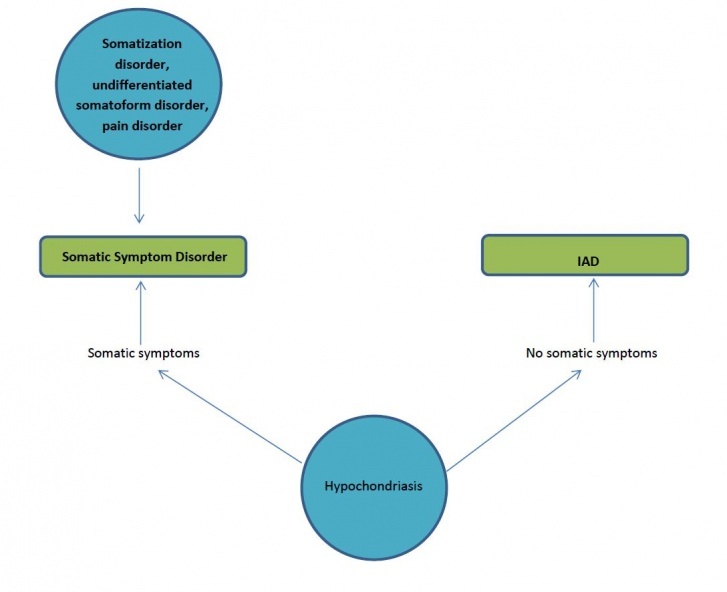 Somatic symptom disorder includes somatization disorder, undifferentiated somatoform disorder, pain disorders and hypochondriasis with somatic symptoms. Hypochondriasis without somatic symptoms is not considered under the realm of SSD and is considered an illness anxiety disorder. ↑ 1.0 1.1 1.2 1.3 Dimsdale J, Creed F, Levenson J, et al. Somatic Symptom Disorder: An important change in DSM. Journal Of Psychosomatic Research [serial online]. September 2013;75(3):223-228. Available from: PsycINFO, Ipswich, MA. Accessed March 7, 2014. ↑ Van noorden MS, Giltay EJ, Van der wee NJ, Zitman FG. [The Leiden Routine Outcome Monitoring Study: mood, anxiety and somatoform disorders in patients attending a day clinic]. Tijdschr Psychiatr. 2014;56(1):22-31. ↑ Fink P, Hansen M, Søndergaard L. Somatoform disorders among first-time referrals to a neurology service. Psychosomatics: Journal Of Consultation Liaison Psychiatry [serial online]. November 2005;46(6):540-548. Available from: PsycINFO, Ipswich, MA. Accessed March 19, 2014. ↑ Ghanizadeh A, Firoozabadi A. A review of somatoform disorders in DSM-IV and somatic symptom disorders in proposed DSM-V. Psychiatr Danub. 2012;24(4):353-8. ↑ Mayou R. ABC of psychological medicine: Functional somatic symptoms and syndromes. BMJ. 2002;325(7358):265-268. ↑ Somatic Symptom Disorder. Available at: http://www.patient.co.uk/doctor/somatic-symptom-disorder. Accessed March 25, 2014. ↑ Somashekar B, Jainer A, Wuntakal B. Psychopharmacotherapy of somatic symptoms disorders. Int Rev Psychiatry. 2013;25(1):107-15. ↑ Sharpe M. Somatic symptoms: beyond 'medically unexplained'. Br J Psychiatry. 2013;203(5):320-1. ↑ 13.0 13.1 Allen L, Woolfolk R, Escobar J, Gara M, Hamer R. Cognitive-behavioral therapy for somatization disorder: a randomized controlled trial. Archives Of Internal Medicine [serial online]. July 24, 2006;166(14):1512-1518. Available from: CINAHL, Ipswich, MA. Accessed March 13, 2014. ↑ Rubin J. Psychosomatic Pain: New Insights and Management Strategies. Southern Medical Journal [serial online]. November 2005;98(11):1099-1110. Available from: Academic Search Premier, Ipswich, MA. Accessed March 13, 2014. ↑ Gierk B, Kohlmann S, Kroenke K, et al. The Somatic Symptom Scale-8 (SSS-8): A Brief Measure of Somatic Symptom Burden. JAMA Intern Med. 2014;174(3):399-407. ↑ Tomenson B, Essau C, Jacobi F, et al. Total somatic symptom score as a predictor of health outcome in somatic symptom disorders. Br J Psychiatry. 2013;203(5):373-80. ↑ Available at: http://www.inkling.com/read/behavioral-science-in-medicine-barbara-fadem-2nd/chapter-16/somatic-symptom-formaly. Accessed March 10th, 2014.